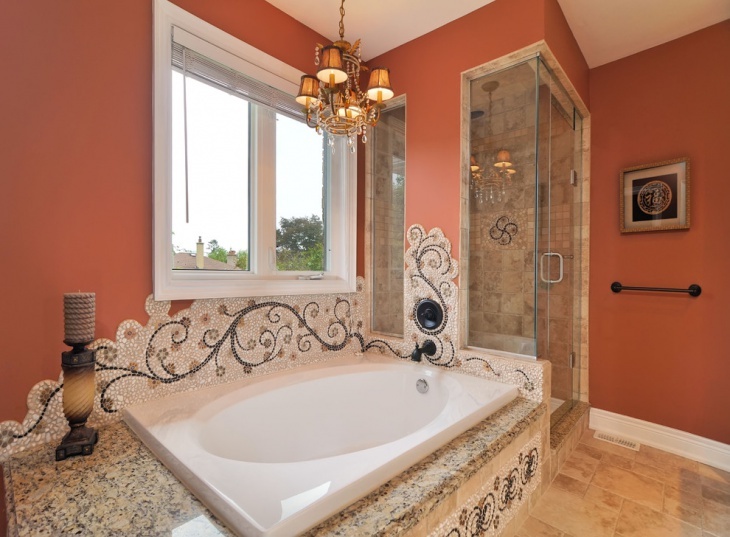 Moroccan bathroom designs are very popular and trending globally due to its lavish interiors and rich color schemes. Moroccan accent and décor feature bold motifs and intriguing patterns which make them a hit in not just bedrooms and other living spaces but also in bathroom designs. Moroccan designs typically include concrete walls, ceramic sinks and fancy candle lanterns alongside beautiful wooden cabinetry and soft curtains. 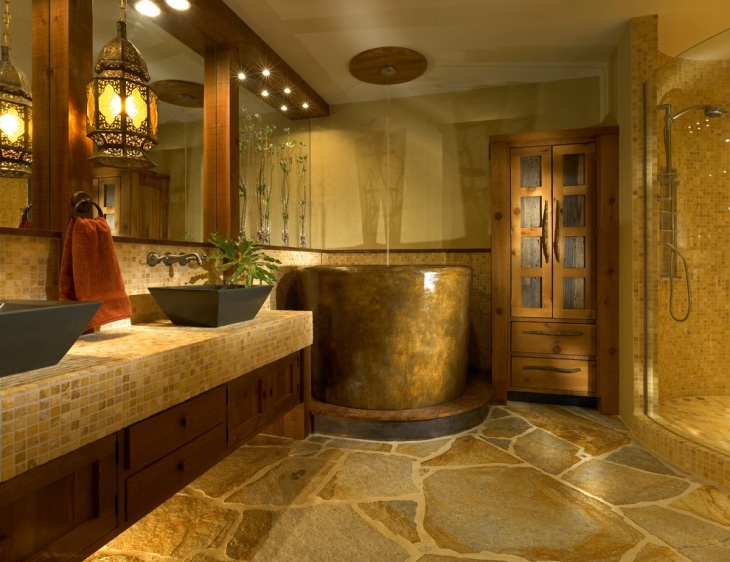 The following are some of the top Moroccan bathroom designs summed up below. This rich navy blue bathroom design also featuring a regal chandelier light on the ceiling has a walk in shower area with ceramic wall tiles. It has a whirlpool tub shower and traditional style windows just next to the shower. This beautiful Moroccan bathroom has Turkish blue tile design which is the main highlight of the bathroom space. It also features a royal golden jewel tone chandelier that hangs in the ceiling and the oriental rugs and pillows truly reflect the vintage Moroccan-style. 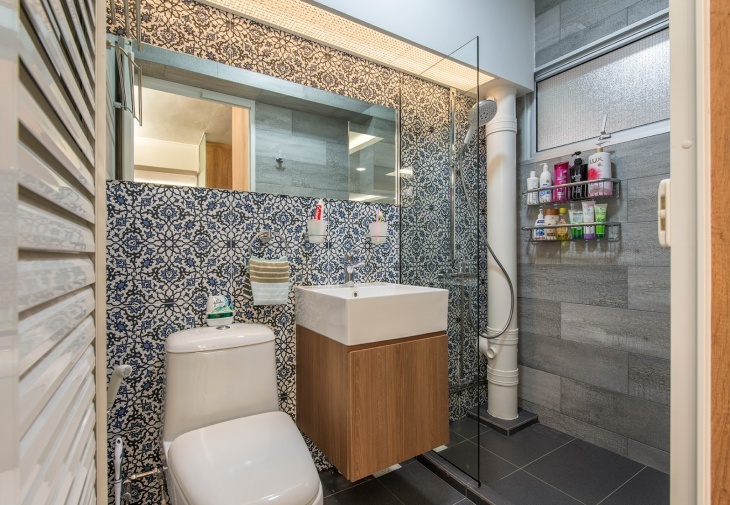 This Moroccan bathroom features a bold patterned wall alongside a glass door for the shower area. 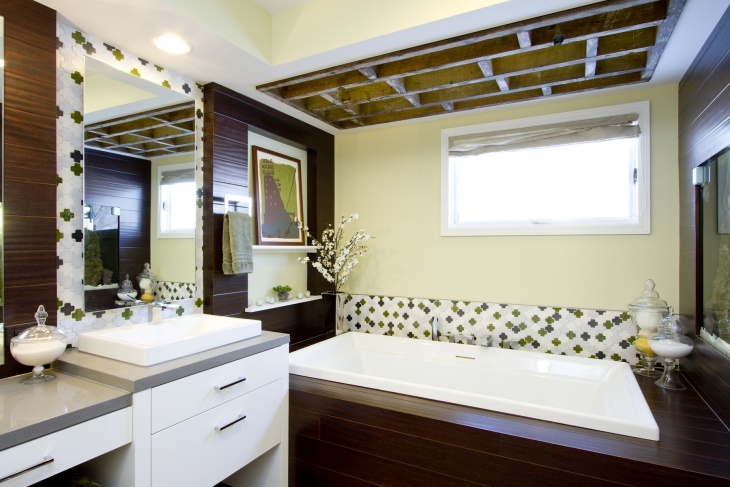 It has a rectangular sink which sits atop a wooden cabinet with a single door. 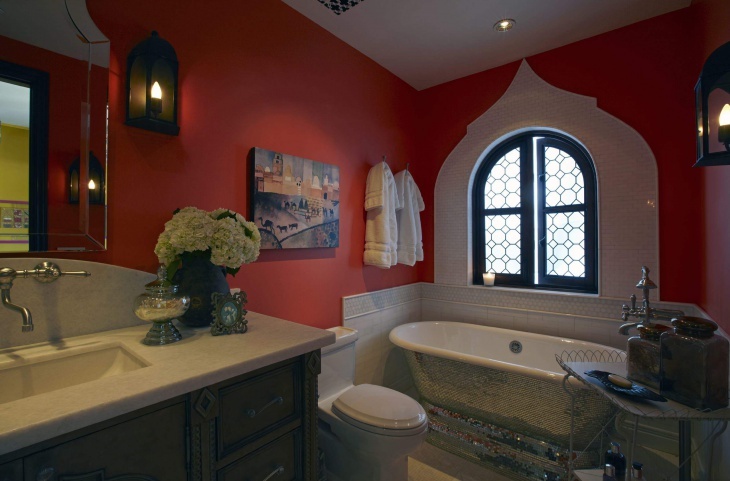 This beautiful bathroom featuring red walls is a true reflection of Moroccan style, the crown molding around the window which is right next to a patterned bathtub is the highlighting factor of this bathroom space. This Moroccan bathroom with light green walls coupled with dark wooden walls represents a contemporary streak in the bathroom space. It contains a tank topper cabinet in white which is made of decor material and has a glossy finish to it. This all white Moroccan bathroom with a Victorian look features Moroccan ash-bury tiles and Hundi lantern light fixtures fitted in the walls above the dual countertops. 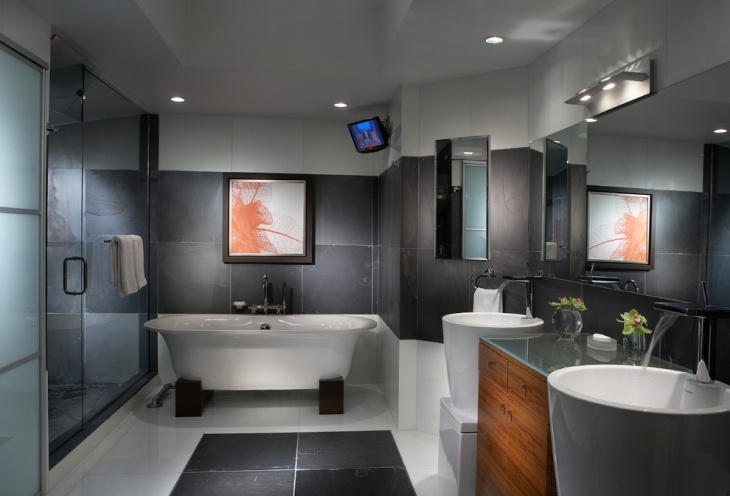 The mood lighting enhances the ambiance of this sophisticated white master bathroom. This is yet another modern bathroom which has a white-on-white theme and features Moroccan carved wood panels. The flooring is of Moroccan ash bury tiles in gray color, and a wooden vanity with a white countertop and under mount sink. This is an extravagant white bathroom with a double sink with a corner tub, and the tray ceiling complements with the gothic windows of the space. It also has a ceiling mounted shower curtain that can be pulled loose while taking a bath. 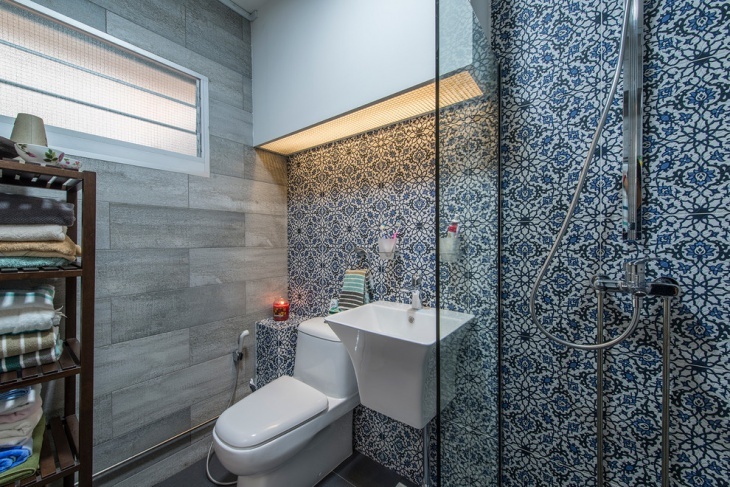 This traditional Moroccan bathroom contains a deep double soaking tub and a glass door area which has a wooden shower bench for soaking in steam. The light fixtures add peaceful vibes to this all white bathroom space. 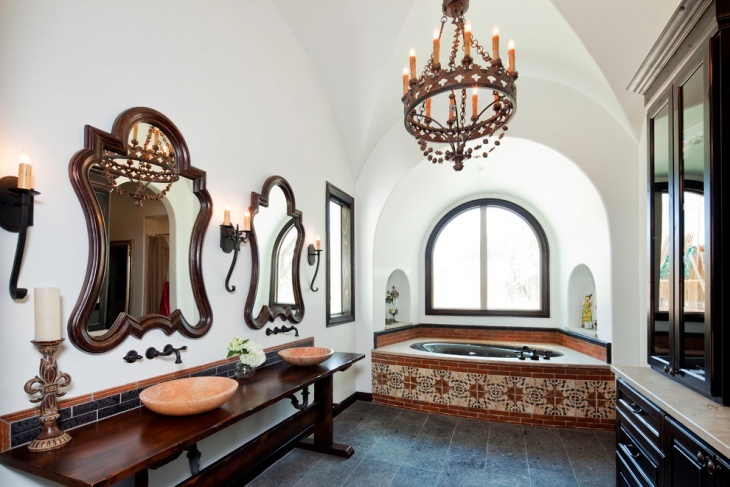 This luxurious Moroccan-style bathroom has an awesome design. 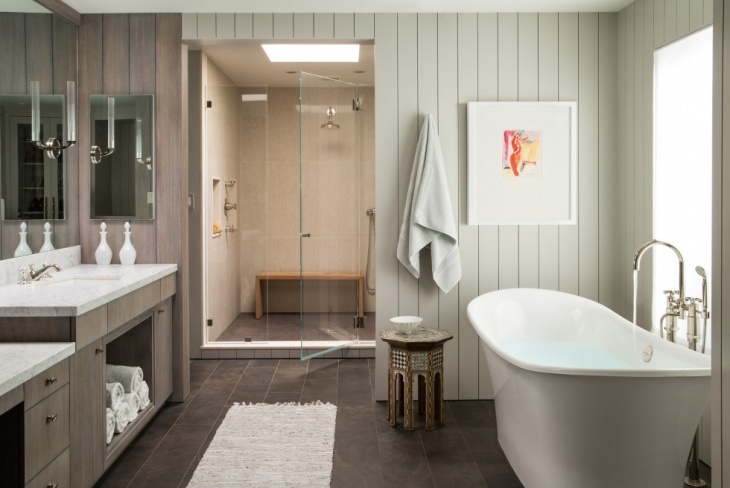 With a standalone tub placed next to the large windows and long cabinets to store the towels and other bathroom essentials. The gray walls, focus lights on the ceiling and the cabinetry, all of these add to the lavish look and feel of this master bathroom. 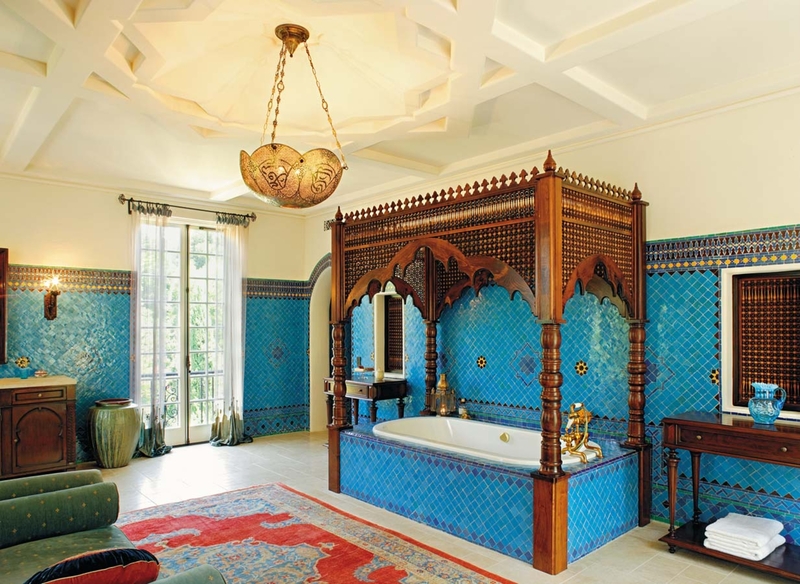 Moroccan bathrooms have been in trend because of their luxurious appearance and their vintage décor. 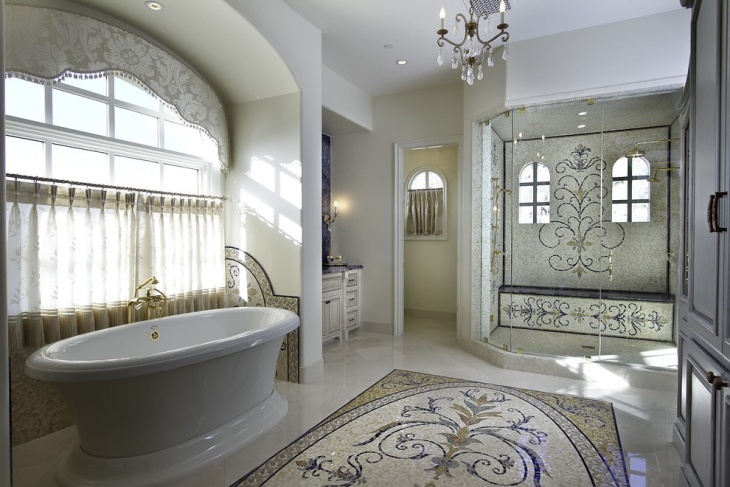 Moroccan bathrooms are coupled with contemporary designs today which have been gaining popularity lately. You could incorporate any of these designs in your bathroom space or you can remodel or renovate your existing space with one of the above stunning Moroccan-inspired designs.